I used to be quite obsessed with copying and adapting recipes, organizing them and amassing a collection. But I have to admit that I have lost interest in that aspect of cooking, which may help explain why this blog has been so lamentably neglected as of late. It has become clear to me that I really no longer need to expend my labor in copying or collecting recipes. The age of the “just in time” recipe is here. Via my relatively small cookbook collection, I have access to over 20,000 recipes (according to my library on Eat Your Blogs), and once I go online, that number expands exponentially into infinitude. If I want a recipe for something, anything, chances are I can find it within seconds. There does not seem to be much point in writing down recipes anymore. Lately, I have become much more interested in combining recipes into menus — menus that are both interesting to eat and easy to execute. Rather than recipes, it is menus that I have been playing around with, collecting and organizing. Neither my cookbooks nor the online world seem to provide more than the most basic guidance on how to create a successful menu. Yet most recipes don’t alone make a full meal. Each meal requires a new menu. I am starting to come up with some rules for what makes a good menu. The first rule is that the menu must encompass no more than four separate dishes. Four seems to be the greatest number of dishes I can make without frustration in one cooking session. Three dishes is an ideal menu, in one of these combinations: a starter, an entree and a side; a starter, an entree and a dessert; or an entree, a side and a dessert. For a lighter meal, I can definitely get away with a menu of only two different items. Another rule is balance. Of course, different kinds of foods, tastes and textures should balance one another. But to save the sanity of the cook, it is also necessary to balance complexity of dishes. If I am making one elaborate dish, the rest of the menu should be composed of relatively simple recipes. A simple entree, such as roast chicken, calls for a more elaborate side, though, in order to keep the meal from becoming boring. I will try to post some of my more successful menus here, with links to the recipes, of course. Planning a menu for the week helps me keep my shopping and cooking on track, and also helps me meet my goal to have a home-cooked, healthy meal most nights. By planning ahead, I can also ensure that I’ve got prepared ingredients and leftovers to make cooking easier as the week gets more hectic. I’ve experimented a lot with different menus and dishes, and at least for weeknight cooking, I keep coming back to the same roster of dishes. They cook easily using ingredients I can easily find, but they can be changed up each week for variety. Here is my basic menu for a week’s worth of cooking, developed with these principles in mind. I do try to remain flexible to take advantage of special occasions, requests from family members or the availability of a seasonal ingredient. Sunday: baked casserole or hearty soup served with a big salad. Because my Sundays are usually open, this is a good day to do a lot of prep work and make things easier for weeknight cooking. A family dinner calls for hearty comfort food that results in leftovers for lunch or dinner. Macaroni and cheese, baked ziti, chili, ratatouille, potato soup–there are endless possibilities. If I get started early enough, I can even break out the slow cooker. To accompany it, I make a salad using seasonal ingredients, including a salad dressing of the week that I can repurpose for lunches. This gives me the opportunity to prep all the vegetables from my weekly shopping trip. Monday: sauteed or roasted boneless chicken breasts, potatoes and vegetable. This is a hearty meal that is also quick to prepare. I can vary it with different quick sauces or by adding some cheese or prosciutto, and there are about a million ways to make potatoes. For the vegetable, I stick to what’s in season and look for simple preparation methods. All leftovers can be repurposed for other dishes as the week goes on. Tuesday: pasta with tomato sauce or broccoli, or stir-fried noodles. All of these pasta dishes are quick to prepare and kid-friendly. This meal can easily be made vegetarian, or adapted depending on what is in the fridge and pantry. Wednesday: tacos or wraps. This is the perfect night to use up any leftover vegetables or cooked meat, but if no leftovers are available, I can quickly whip up beans or ground meat for a taco filling. Leftover salad and sauces can often be repurposed as toppings. Thursday: frittata. By this point in the week, the cupboard is getting a little bare, but we always have eggs. 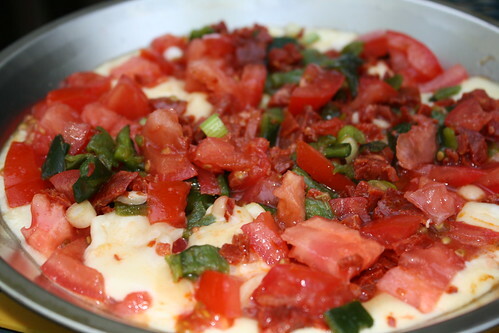 Any bits of meat or vegetables remaining can be quickly cooked for the frittata filling, while shredded cheese from the tacos goes on top. Leftovers make a good breakfast or lunch for the weekend. If we don’t feel like frittata, scrambled eggs and bacon or baked eggs are a great substitute. Friday and Saturday: pizza, sandwiches, grill or special requests. If we don’t go out to dinner, the weekend is a good time to make something fun that everyone enjoys. Sunday breakfast: I usually try to make a hearty breakfast on Sundays of bacon and eggs, bagels or some other baked treat. I’m sorry that this update has been so long in coming. I was busy with a project all last week, plus I got a touch of something over the weekend that kept me from blogging and cooking. So I’m taking this past weekend off and playing catch-up. This challenge is actually from one week ago. The challenge was to make a Mexican meal, but not to fall back on the usual suspects. That means no tacos, burritos, enchiladas, fajitas — basically, nothing wrapped in a tortilla. I immediately decided that I wanted to make several small plates, like a tasting menu. Appetizers are often my favorite dishes in Mexican cooking, anyway, and that would give me a chance to try three or four new dishes. For help, I turned to Rick Bayless, specifically his cookbooks Authentic Mexican and Rick Bayless’s Mexican Kitchen. You may know Rick Bayless from his stint on Top Chef Masters or from his restaurants in Chicago (which I have yet to visit, although my husband has been several times). I love his cookbooks because they make authentic Mexican cooking accessible to the home cook. He gives lots of helpful advice about ingredients, timing, and varying the recipes, and they usually turn out delicious. I won’t be reprinting any of his recipes here, so I urge you to check out his books for yourself. 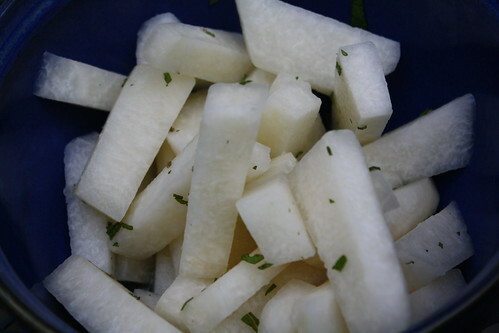 Jicama sticks with lime and mint. If you’ve never had jicama before, it’s a very refreshing starter. It’s crisp and cool like a cucumber, but the taste is closer to a very mild radish. Look for jicama in the grocery store; it’s a gigantic, waxy thing that looks like an oversized turnip, but it’s easy to peel and cut up into sticks. Marinate the sticks in a little lime juice and lemon juice, chopped mint leaves and salt. We were crunching on these all week long. This was my toddler’s favorite dish of the night. Seviche is seafood that is “cooked” by marinating it for several hours in lime juice. I’ve never made seviche at home before, mostly because I was afraid of dealing with the uncooked fish. But we like tuna pretty rare anyway, so that seemed like a good fish to use for my first attempt. 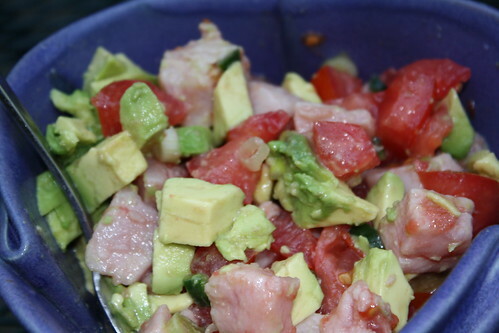 This was a very refreshing salad, especially because it’s combined with a fresh, vibrant tomato and avocado salsa. A little chopped serrano chile provides a hint of heat. My husband and I both enjoyed this one. Melted queso with chorizo, roasted poblanos and tomatoes, served with corn chips for dipping. This was my favorite dish of the night. I could probably have eaten it until I burst. I used chihuahua cheese, which has a wonderful mild but cheesy flavor. I melted the cubes of cheese in a metal pie plate to try to retain the heat. To the melted cheese I added roasted poblano pepper, crumbled chorizo, scallions and diced tomato. We just scooped it all up with corn chips. I think this mixture would work very well as a topping for nachos. We had about half left over, and it reheated nicely the next night in the same pie plate. 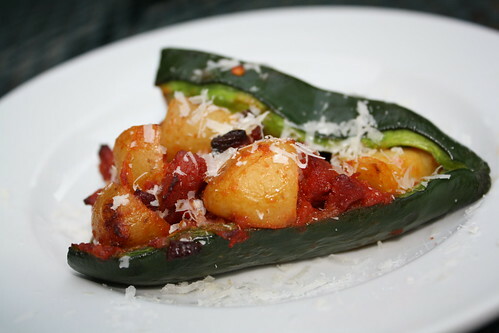 Baked poblano peppers stuffed with chorizo and potatoes, topped with a tomato-chipotle sauce. This was an intense, flavorful dish. Sharing one pepper was plenty for my husband and me. I had to modify the original recipe, which called for dried ancho peppers instead of fresh poblanos, so this is closer to a chile relleno. I stuffed it with a mixture of pan-fried chorizo and potatoes and sauced it with a spicy tomato-chipotle sauce. That’s parmesan sprinkled on top. It was hot, but not overwhelmingly so. This was my husband’s favorite dish due to the mouth-popping flavor combination. And I made a delicious red wine sangria to accompany. I mixed cheap red wine with lemon juice, lime juice, orange juice, and seltzer water over ice, and popped in a sprig of mint leaves. The result was way too drinkable! My husband said that this was my most successful challenge yet, mainly because I stretched myself and made dishes that I wouldn’t normally cook at home. And because everything came out so deliciously. We stretched our stomachs too, as we ate way more than we should. This would make an awesome menu for a Mexican-themed party, especially held outside on the deck on a warm night. I’m hoping to tackle the next challenge later this week. The challenge is to make a kid’s favorite dinner at home: chicken nuggets and fries. Since I don’t deep-fry, this will require some creativity. Look for the results next week. I could tell that summer is winding down even if I didn’t know the date. The humidity and record temperatures have thankfully eased off. The garden is looking bedraggled and is only spitting out the odd zucchini at this point. Winter squash and root vegetables are becoming prevalent at the farmers market. It was an excellent meal — almost like a picnic at the dinner table. Everything was good, but the refrigerator pickles, a recipe from Sara Foster’s Fresh Every Day, were particularly easy and tasty, so I wanted to share the recipe with you (with my few minor adaptations). 4 to 5 small cucumbers, sliced into ⅛-inch-thick rounds — You could use pickling cucumbers, but I used the regular kind, and they worked fine. Combine the vinegar, sugar, salt, black pepper, cloves, bay leaves, red pepper flakes and dill seed and stir until the sugar has dissolved. Layer the cucumbers and scallions in a quart jar or 2 pint jars. Press them tightly into the jar. Pour the liquid mixture over to cover. Place the lid on the jar, shake it well and refrigerate at least 4 hours. These pickles will keep in the refrigerator for at least 1 month. Happy birthday to my son Sean, who is turning 2 tomorrow but celebrating today!